Take advantage of low inventory. Since most sellers are waiting until spring to list, local inventory falls during the offseason. However, there are still motivated buyers who are ready to move now and don’t want to wait that long to purchase a home. According to the National Association of Realtors, 55 percent of all buyers purchased their home at the time they did because “it was just the right time.”2 These eager buyers may flock to your home. You may not need to try as hard to make your home stand out in the sea of other similar homes. With less competition, more buyers, some of whom may have otherwise overlooked your home if you listed during the peak, will express an interest to buy. 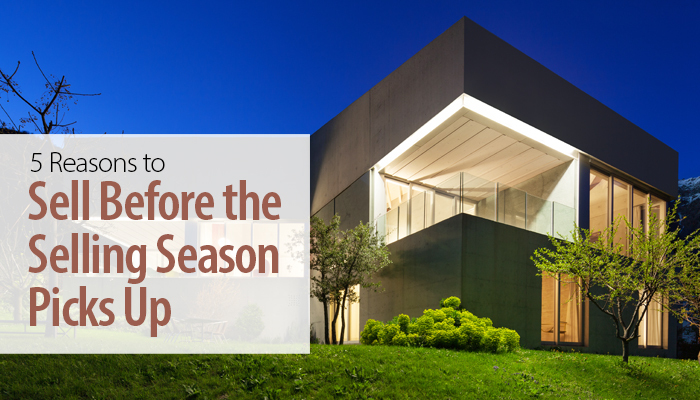 While you’ll likely have fewer showings in the offseason, buyers who do visit will be more serious about writing an offer. Your home will likely sell faster than it would have during the peak season. Set a higher listing price. Homes sold during the offseason sell at a higher price, on average, than those sold during the spring and summer peak. There are many reasons for this. First, motivated buyers are willing to pay closer to the asking price for a home. Second, homes are more likely to be priced right and reflect the economics of not only the local market, but the neighborhood as well. Often, homes listed during the peak may be priced to compete with other homes in the area and neighborhood. Sellers may be pressured to sell for less than the list price in order to encourage buyers to choose their home out of the others on the market. You’ll receive more attention. While our team always strives to give you the personal attention you deserve, when you list during the offseason, we’re able to work more closely with you to ensure your home is prepared for its debut on the market. We can also take more time to answer your questions, address your concerns and prepare you and your home for the sale.Additionally, if you’d like to hire a tradesperson to handle routine maintenance or undertake a minor home renovation before you list, you may be able to take advantage of flexible scheduling and cheaper rates. Many of these professionals experience a winter offseason as well, and will be able to focus their time and attention on you and your project. Easier to maintain curb appeal. Curb appeal is intended to attract the buyers who are just driving by as well as those who saw your home online and wanted to see it in-person. It sets the stage for what interested buyers can expect when they step foot in the home during a showing or open house. If you list your home during the peak of the selling season, you may exhaust your time your energy maintaining curb appeal. You’ll likely spend most of your free time mowing the lawn, weeding, trimming shrubs and hedges, planting flowers in pots and in flowerbeds, pulling spent blooms and watering it all to ensure it looks lush and healthy on a daily basis. After all, a lush landscape will attract potential buyers and set your home apart from other similar homes in the area.The offseason eliminates the pressure to maintain a picture-perfect front landscape. Since most grass, shrubs and plants go dormant at this time of year, you’ll have less to maintain. If you live in an area that experiences a traditional winter, your landscape will be covered with snow. Even if you live in a milder climate, you may not have to mow as often, if at all. It’s still important to ensure your exterior appears well-tended, so make sure your walkway and front porch remains free of snow, ice and debris. Tap into the life changes of buyers. Many buyers receive employee raises and bonuses at the end of the year. If they’ve been saving to buy a home, this extra money may allow them to reach their goal for a down payment and put them on the path to becoming a homeowner. Additionally, companies often hire new employees and relocate current ones during the first quarter of the year, creating a strong demand for housing. If you live in an area that’s home to a large company or has a strong corporate presence, this may be the perfect time to list. Create light. Balance out the lack of natural light outdoors by turning the lights on inside. Since people naturally tend to buy emotionally, turning on the lights helps create a sense of warmth and coziness. Light a fire in the fireplace, if you have one, fill your home with the scents of the season, such as vanilla or fresh baked cookies, and put a throw blanket on your sofa.If you plan to paint the interior of your home before you list, consider an off-white shade to create consistency throughout your home and make the space feel larger and brighter. If you have photos of your garden or the home’s exterior in the spring or summer, display them so interested buyers can get a glimpse of what the home looks like in other seasons..
Give your home a thorough cleaning. Cleaning puts your home in its best light. Clean and polish all the horizontal surfaces of your home, including countertops, window sills and baseboards; have the curtains dry cleaned or otherwise laundered; wash windows, glass doors and their tracks; vacuum carpeting and polish all wood surfaces, including the floor.Additionally, this is a great time to pack any personal items and family photos as well as sort through your belongings and donate items you no longer use. This not only eliminates any clutter, but it also gives you less to pack and move when you sell. If you’re thinking of selling, give us a call! We’d love to help you position your home to sell in our market. Enthusiasm and a passion for life are two of the driving forces behind Skeeter’s real estate practice - and his life. He describes himself as a happy and fortunate person, and he brings that positive attitude to everything he undertakes. Residing in Hawaii his whole life gives him the unique knowledge of the local life style and market. That helps him negotiate the best deal in your favor. In January of 2013, after 14 years in the business, he received his brokers license showing that he has the knowledge and experience to help you with your property needs. Whether it's buying or selling your property he's hear to help. Skeeter will work with you and together find the best strategy to accomplish your goals. Skeeter is a specialist when it comes to finishes. As Vice President of Marble Innovations, the states largest stone supply company for 10 1/2 years, he has sold and installed every type of stone product imaginable. From custom water falls coming out of walls to sculpted one piece fire places, he has .... This attention to detail will help when it comes to achieving your real estate goals. While he embraces technology as a tool (e-PRO credentials) to help him communicate with clients and market his listings, he believes in old-fashioned activities like answering his phone, listening carefully, and being responsive to his client's wants, needs, questions, and concerns is most important. Skeeter gives you the information you need to move through the process of buying or selling a home with the least possible stress or uncertainty. His belief is that knowledge of today's market leads to good decisions. When clients know what to expect at each step along the way, it makes the entire transaction more enjoyable for everyone. His link to the Lahaina Community and Maui County runs deep. He has been a member of the Rotary Club of Lahaina Sunrises for seven years and is to be club President in 2014-2015. He is an active member of Lahaina Yacht Club and has served on the board for 8 years as Port Captain and Vice-Commodore. Skeeter is also very active with the County of Maui Volunteer Center helping with there HandsonMaui.com website and other Special Volunteer Events. He believes service above self and it takes helping others to really help your self. If you are think of buying or selling property in Hawaii call Skeeter at (808) 870-9813 or drop him a line at ws@LovelyMauiHomes.com.